Sterling silver twist wire tear drop earring. 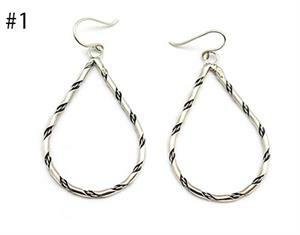 It measures approximately 2 1/8" long including sterling silver french wires. It is Navajo hand made by (now deceased) Phillip Tsosie. There are two different styles of twisted wire. Choose style when ordering.